The success of the 2276cc Talbot 90 in the 3 litre sports car class encouraged team owner Arthur Fox to exploit the capacity limit with a full three litre engine. Georges Roesch responded with a clever re-design of the 75 unit and thus the immortal Talbot 105 was born in 1931. Bore and stroke were stretched to 75mmx112mm within the same overall dimension. Bigger valves were staggered across the cylinder head and operated by unequal length rockers. A 48mm downdraft Zenith carburettor sat atop free flowing inlet and exhaust manifolds. The racing engines, running at 10:1 compression produced 140bhp. The cars were an immediate hit at Brooklands and Le Mans and excelled at long distance rallying. Talbot 105 teams won the gruelling Alpine Cup in 1932 and 1934. Road versions appeared from 1932. The lower compression 95, on a 10’ chassis, was the mainstay of the saloon range. The more powerful 105, on a 9’6” chassis, was the glamour car. Developing 100bhp it stood at the head of it’s class and attracted the attention of the top coach builders. Vanden Plas’s graceful four seater tourer is the iconic image of this car. The limitations of the direct drive dynamotor meant all 3 litre cars adopted a 12/24v twin battery layout. The pre selector gearbox appeared in 1933 and was the perfect match for this powerful, high revving engine. In 1935 the range went through a substantial re-design. A new dropped chassis lowered the body line and the cars became easier to drive with a “traffic” clutch and semi automatic gearbox. Roesch stretched the cylinder bore to it’s maximum of 80mm. The resulting 123 bhp Talbot 110 was the most powerful to bear the name. A seven seater, on a 11’4” chassis, even took Talbot into the rarified limousine market. A bold new “Airline” body by Darracq put them at the forefront of contemporary car styling. The Rootes takeover saw a simplification of these complex cars with conventional 12v starting, restrained styling and the option of a four speed syncromesh gearbox. 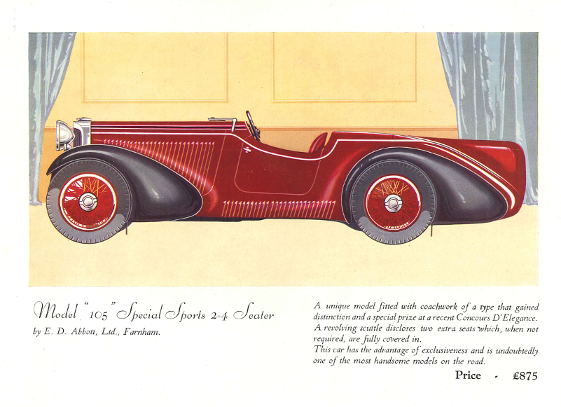 They remained in production until mid 1937, by which time nearly 1700 had left the factory. The 105 is now the most sought after of all the Talbots. Their competition success continues with recent victories in the Alpine Trial, Flying Scotsman and Le Mans Classic. They are probably the most versatile of all pre war cars, offering current levels of performance, with good road holding, braking and comfort. It is no surprise that there is hardly an Alpine pass that does not have the tyre tracks of a Talbot 105 on it!